Limited Edition Print, signed and numbered by Eleanor Mann. Fits standard 10" x 12" frame. £25 plus 2nd class recorded delivery post and packing. 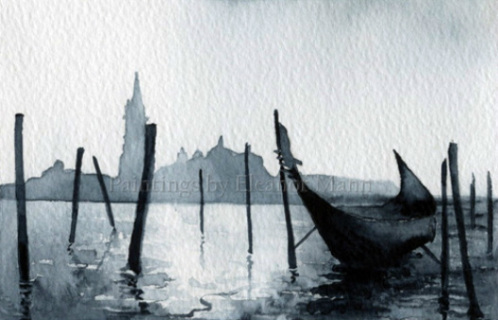 Watercolour picture of the view toward San Giorgio Maggiore, Venice. San Giorgio Maggiore is one of the islands of Venice in northern Italy surrounded by the lagoon. Limited Edition prints are available. They fit a standard 10" x 12" frame. £20 (plus PP).